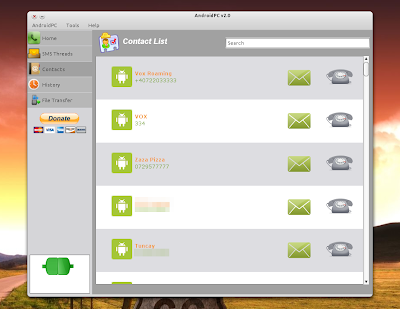 AndroidPC is a free Android application that lets you send and receive SMS messages (and notifies you when you receive new SMS messages through a popup), pickup or deny calls, send/receive files and urls, synchronize contacts with avatars and more - all from your computer. For now the application only works through WiFi. The computer part runs on Linux, Windows and Mac. 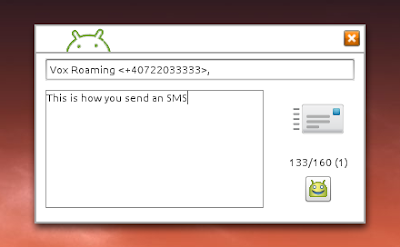 Even though the idea is great, AndroidPC has a few quirks: if you receive an SMS and you don't see the notification, the notification area icon doesn't change so you have to open the dashboard to see it. Also, it doesn't display notifications for calls but you can see these in the history, along with the received SMS messages. What I didn't test is the call feature so I'm not sure how that works. 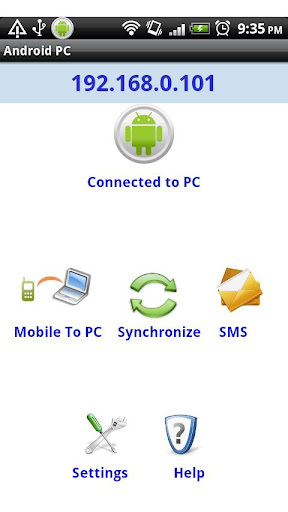 Download the Android part via the Android Market (that's a link to the new web market) and the PC part from HERE. Please note that you need JRE to install the PC part. To use it, open the Android app, then on your computer right click the AndroidPC icon in your notification area, select "Open Dashboard" and here select "Connect to Android". The first time you you'll need to syncronize your Android device with your PC - to do this, click the "Synchronize" icon on your phone or go to or select AndroidPC > Synchronize on the AndroidPC dashboard on your computer. If you have trouble setting everything up, the Android PC website has a full how-to on this. To add the application to startup in Linux, go to System > Preferences > Startup Applications, add a new startup program and under "Command" enter "javaws /path/to/androidpc.jnlp" (replace /path/to with the path to where you've downloaded androidpc.jnlp).